Butter beans handle the summer heat and rains with few problems. The cultivar currently planted at the UF/IFAS Extension Wakulla County demonstration garden is Henderson, a popular and prolific heirloom variety. There was a time in Wakulla County before air conditioning became commonly available, that families spent much of their summers outside. Children played in the yards and woods, and the adults enjoyed the shade and comfort of the porch. No porch was complete without rocking chairs. Even in the elevated temperatures and humidity typical to the season, these swaying seats were an inviting amenity which encouraged social interaction and minimized the pain of some chores. The chores in those days often times involved repetitive and tedious task which could be done in the rocking chair. One of those recurring jobs was shelling the hot weather garden staple butter beans. Phaseolus lunatus is commonly known as the butter bean or with larger cultivars known as the lima bean. Color of the bean is also an identifying indicator. Limas are usually green and butterbeans white or yellow, but there are green butterbean cultivars. Additionally, there are a few named varieties which are purple, red speckled and dappled brown. This legume is a “new world” native with its origin in Central and South America long before the first Spanish conquistadores arrived. As with other successful vegetables, the yields and portability in the days before modern preservation methods made this a very useful foodstuff. While there are 70 distinct species in the Phaseolus genus, only a few are widely recognized or used as a food source. Stringbeans and mong beans are some of the most notable members in the same genus with butter beans. Along with many other items procured from the inhabitants of the Americas, butter beans were transported to Europe for cultivation and have since spread far beyond. Today, many cultures around the world have butter or lima beans as the basis for dishes prepared to local taste and preferences. There are both bush and pole or vining cultivars to choose from when sowing a crop. The bush cultivars tend to mature earlier than the pole cultivars varieties, but weather and environmental conditions can influence the results. A great warm season crop, the seeds are inexpensive and easy to plant. Seed depth is about half an inch and 24 inches between plants will keep the garden workable. The pole cultivars can vary from three to 15 feet in length and require sturdy structures upon which to climb. Bush varieties may reach three feet in height. Days to harvest range from about 60 to 90, with the weather being a major determinate for the speed of the plants’ growth. The small, white blooms after 30 to 40 days and quickly develop into pod. The pods can be up to six inches long. In most cultivars the seeds are relatively flat, but some cultivars have almost a spherical shape. 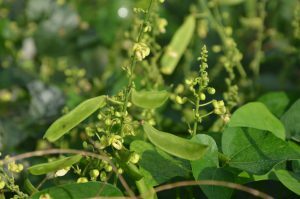 There are two diseases in north Florida which can be a problem for butter or lima bean production. Anthracnose affects all above-ground portions of the bean plant which turns yellowish-brown or purple-colored, irregular, and with sunken spots with dark reddish-brown borders. Fusarium Root Rot appears as a reddish discoloration on the taproot as early as one week after plants emergence. Root lesions enlarge and turn dark brown in color with clusters of roots developing above the lesion and below the soil line as the main taproot becomes riddled with longitudinal cracks, then hollows and dries. Purchasing disease free seed, crop rotation and maintaining adequate nematode control are practices which will improve the crop’s potential for success. All that is need now is a porch, a pair of rocking chairs, and a friend to talk with while shelling the butter beans. For more information about growing butter beans in Wakulla County, contact the UF/IFAS Wakulla County Extension Office at 850-926-3931 or http://blogs.ifas.ufl.edu/wakullaco/.